"This dish has a nice bite to it with lots of cheese. It is equally delicious with cooked pork or beef." In a heavy skillet, lightly fry tortillas in shallow oil, being careful not to make them too crisp to roll. Combine the cheeses and keep 1/2 cup aside for topping. Dip each tortilla in salsa verde (both sides.) Place 2 heaping tablespoons chicken and about 2 tablespoons cheese down the center of each; roll and place seam side down in a shallow dish. After all the rolled tortillas are in the dish, spoon additional salsa verde over them and then cover evenly with heavy cream. Sprinkle with remaining 1/2 cup cheese mixture, and with the green onions. Bake uncovered in preheated oven for 20 minutes. Serve immediately, garnished with the olives, cherry tomatoes, and with additional salsa on the side. 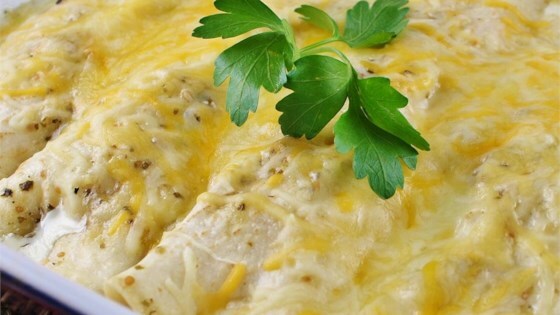 See how to make chicken enchiladas with a zesty tomatillo sauce. Black olives can be used in place of the green olives, if desired.